Did National Geographic really call Dubois WY the most remote town in the lower 48? How remote is it, actually? Google “Dubois WY” and you’ll soon encounter a statement that it has been designated the most remote town (or sometimes the second remotest town) in the lower 48 states. Often this distinction is attributed to National Geographic. When we moved to Dubois, my husband and I quickly took up calling it one of the most remote towns in the lower 48 when we described it to friends. We even trotted out some criteria, whose origin I no longer recall: Farthest from the nearest Interstate, fewest traffic lights (none), fewest number of highways that run through it (one), distance to the nearest large town (about 70 miles), or proportion of land within a 360-degree radius that is publicly owned (who knows, but lots). But is this distinction actually deserved? How remote is Dubois, and compared to what and by which criteria? Last summer I began to study the question, with interesting results. First, I couldn’t find any such statement about Dubois in the archives of National Geographic. And many other towns lay claim to the distinction of being most remote. This traced back to a strategic plan for Dubois by the Foundation for Urban & Neighborhood Development of Denver, Colorado, dated 1986. The report said that Dubois had been “recently identified in national news media coverage” as the most remote location in the lower 48–the same unconfirmed designation that I was already seeing, albeit even older. Delightful, written when the railroads were still expanding, and perhaps an insight into the town’s perception of isolation. But not that relevant today. In the course of promoting Living Dubois on Twitter, I was fortunate to gain the interest of Marilyn Terrell, chief researcher for National Geographic, who has also been unable to find any source for that attribution of Dubois’ remoteness by her publication (so we ought to stop using it). But she did point me to an article in Smithsonian magazine describing what truly may be the most remote settlement in the lower 48: the community of Supai, Arizona, located at the base of the Grand Canyon. At the bottom of that 3,000-foot crevasse, it is reachable only by mule train, which is how they get their mail. But Supai isn’t really a town: It’s designated by the US Census Bureau as a “census-designated place,” which is the Bureau’s term for a populated place that is not an incorporated village and has no municipal government. So does Dubois still qualify? Author Henry Grabar on the website citylab.com looked into which towns were most remote by the criterion of being farthest from the nearest Interstate highway, honoring Key West, Florida, as being farthest as the crow flies, and Copper Harbor and Eagle Harbor, Michigan, (251 and 238 driving miles from the nearest Interstate), with an honorable mention to Paisley, Oregon (209 miles) due to the sheer difficulty of driving to the big highway. Dubois is “only” about 173 miles from the nearest Interstate, at Idaho Falls, and is interestingly equidistant from Interstates at Rawlins, Casper, and Livingston MT (200, 199, and 199 miles, respectively). But considering only towns that are completely surrounded by Interstates (rather than having a national border or large body of water on at least one side), I do wonder whether Dubois might qualify as having the largest average distance to the Interstate in all 4 directions (193 miles). If you aren’t familiar with Dubois, please be assured that you can buy plenty of groceries and hardware supplies in town, and it’s even easy to find a cafe latte. And by that other criterion of remoteness, Internet access, Dubois is marvellously well-connected. You feel the remoteness mostly by your proximity to all that wilderness. Speaking of which, there is one remoteness criterion Dubois can legitimately claim without dispute: It is closer than any other town in the United States to the spot in the lower 48 that is most remote from any road, and therefore reachable only on foot or by horseback. This is Two Ocean Plateau in the southeastern corner of Yellowstone Park. This spot has been designated by the United States Geological Service as the location in the “coterminous” United States that is most distant from any road (the trailhead is at Moran, an unincorporated community). Dubois is 44.1 miles from Two Ocean Pass as the crow flies, and the plateau is farther north. Jackson is 48.8 miles away. There is one criterion for remoteness by which Dubois fails miserably. The residents are hardly remote in their behavior toward other people. It’s one of the friendliest places I’ve ever encountered, which is one reason we go all that way to get there. You can sign up at the top of the right column at http://www.duboiswyoming.com to see new posts on LivingDubois via email. Can you see past the superstars? I hear that you decided to dump the Big Apple. Sounds from your sad little blog post on Valentine’s Day (how poignant!) like you’re not planning to open a different HQ2 at this time. You sounded a little broken up about the break-up. That brought it all powerfully back: The lights, the buzz, the sounds, the gorgeous, cosmopolitan, purpose-driven people. It was all so thrilling! But I got over it too, eventually. Believe me, I can understand. All those spats about how she was offended that you wanted a few accommodations in exchange for moving in could totally kill the magic before you got to the altar. 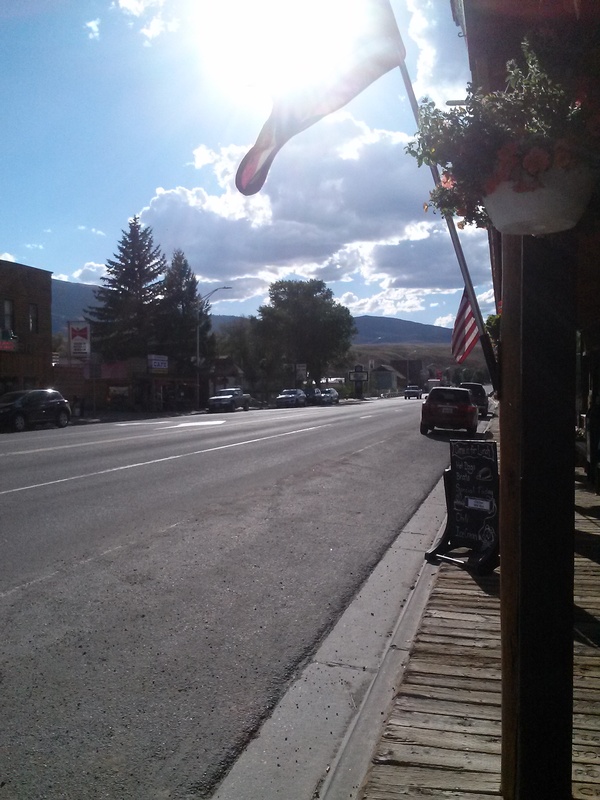 Here in remote little Dubois, we hope for the same pleasures whose loss Peggy Noonan was lamenting: busy sidewalks, shops and restaurants that are humming and hiring. And not just in midsummer. Don’t get me wrong, Jeff: I’m not suggesting that you consider Dubois for your next engagement. We couldn’t sustain another 25,000 jobs, even if we had the workforce. We certainly wouldn’t want to balloon our population by 2500%. It would utterly destroy us: our magnificent environment, our way of life, and our beloved small-town character. All we’re asking is one date. Surely among the other educated, skilled people who seek a new life in our truly remote (and tax-free) location, we could spare a place for a few, or a few dozen, who qualify for those “remote” jobs that you regularly post online. Why do companies like yours always gravitate to the big cities? Working on our flawless Internet here at the edge of wilderness in Dubois, I’ve spent a lot of time pondering that. According to a recent article in the New York Times titled “In Superstar Cities, the Rich Get Richer and They Get Amazon,” you want to be in locations where there are already lots of tech workers, because you think that grouping innovative people in one location will stimulate more innovation. Admit it: You guys are always seduced by the divas. Maybe you just can’t help it. Besides, is it all about “superstars?” Countless successful people aren’t superstars (including many of your employees), but are productive and vital to our local and national economy nonetheless. I know some people like that, right here in little Dubois. They work on our Internet, which never fails. They come here partly for the fiberoptic power that comes right to their door. But that’s not the only reason. Some of them are very unusual telecommuters, people who want to find mountains and wildlife outside their front doors rather than art-film cinemas and Starbucks. In their spare time, these people who spend all day at their keyboards want to hike, rock climb, snowshoe, or go fishing rather than hanging out in bars. They prefer the shadow of the starlight to the glare of city lights. Maybe some of your own employees dream of raising their children in a safe and very healthy place where class sizes are small, college acceptance rates are high (because small-town Wyoming is under-represented in their mix and also very interesting), and scholarships actually go begging. Can you help us find some of those people, Jeff, and tell them that we’re here? Author LivingDuboisPosted on February 25, 2019 February 26, 2019 Categories Community Spirit, Geography, Love Letters, Remoteness, TelecommutingLeave a comment on Amazon CEO: Dropped NYC? Date Dubois! Last weekend, I heard Wyoming’s new governor delivering an address at a conference. Mark Gordon began with a virtual driving tour of the scenic wonders of our state. People would whoop as he mentioned their regions – Devil’s Tower, Thermopolis, Lander. What better way to endear yourself to a Wyoming audience than to extol the beauties of our state? Gordon was preaching to the choir, for certain. I waited for a mention of Dubois and a chance to call out. But on his imaginary counter-clockwise circuit, Gordon veered away and entered Yellowstone from the north. I sat back and sampled the little fruit tart in front of me. Eventually, near the end of the speech, I did have a chance for my shout-out and it took me by surprise. Gordon drew toward his close by alluding to his father, and it was not the history I would have imagined. Fundamentally, Mark Gordon–the epitome of a devoted advocate of the spirit of the American West– is in Wyoming because his father fell in love with the West in Dubois. Crawford Gordon (1917-2014) was given one of those patrician East-Coast names made up of two last names joined together. He grew up on a farm in Lincoln, Massachusetts, and went to Harvard University, where he earned a degree in economics. The young Crawford could easily have taken a bank job and stayed on out East, and his son could have been born in Massachusetts. But he chose the tougher life of ranching in Wyoming. That’s because at the age of 15, Crawford visited CM Ranch in Dubois, where he developed a passion for the cowboy spirit and for rodeos. He had begun the evolution to the “Crow” Gordon he would be for the rest of his life. For a while, young Crow Gordon rode the rodeo circuit. He won prizes at the Johnson County Fair and Cheyenne Frontier Days. I wonder what his parents thought. Why does he ride for the money? Why does he rope for half share? He must have gone crazy out there. At the age of 30, Gordon settled with his wife and began ranching near Kaycee, Wyoming, in the northeast of the state. The new governor grew up on that ranch. I had a brief conversation with Mark Gordon last weekend. He is urbane and engaging, but he also has the demeanor of a Wyoming cowboy – soft-spoken and easy-going. Without inquiring, I took him for a rancher, that combination of businessman and farmer that is so prevalent among Wyoming politicians. But like his father, Mark Gordon was educated back East. He went to boarding school in New Hampshire and college in Vermont. After graduating — and I’m sure skipping his father’s dude ranch step, as he did grow up out here — he returned to Wyoming and began ranching. I called the former Mayor yesterday, and she welcomed me to drop by for a copy of the film. When Gordon gave it to her, she uploaded it to her laptop, and then gave copies to the Dubois Museum, the CM Ranch and, yesterday, to me. Called “Deadwood Gold,” the film shot in the 1930s is grainy and funny, impromptu and crowded with extras. Evidently Crow Gordon had inspired everyone staying at the ranch to dress up and pitch in. It’s a 30-minute shoot-em-up Western that has all the classic features: a stagecoach, a gold find, a villain and a sassy lady, and a posse that leap into the stirrup, always galloping on the run off into the hills or back into the corral. One of the “stars” is the founder of the CM Ranch, Charlie Moore, who was the son of a local old-timer. He went to the University of Michigan (my alma mater) for law school, hated it, and returned to open a ranch where he could impress young boys from the East with the independence and adventure of the West. I don’t know precisely how Crow Gordon came to stay at the CM Ranch. Very likely his parents were among those whom Charlie Moore met during his business trips back east to promote his ranch. In the case of the elder Gordon, he clearly achieved his objective. According to an obituary, Gordon’s passions were horses, ranching, rodeo – and opera. Like Charlie Moore and like so many who live out here (including his son, the new governor) he was obviously a fascinating hybrid of the rugged and the refined. So often you find interesting little surprises as you learn about these Wyoming people. I’m still learning that lesson myself. I really, really needed my sleep last night. But when my mind came close to the surface at 4 AM, the Geminid meteor shower drifted in. I had read about the event in my news feed, and had wished I could witness it. After a while, I gave up trying to sleep. I got up, made a cup of herbal tea, and drew a chair up to the window. These are the dark times in Dubois, when daylight ends in late afternoon and we try to find ways to stay alert through the long dark evenings until bedtime. There are two compensations for this: 1. It’s also the holidays, and 2. We’re blessed to live in a dark sky location. The sky is not just dark; it’s profoundly dark. It feels as if you can see all the stars there are. Back in Brooklyn, when I thought of God’s promise to Abraham that his descendants would number like the stars, I had the impression that God meant he’d have 3 or 4 grandchildren. But as I approached the window last night, in every direction I looked, the sky above our wilderness was a riot of stars. They glittered in the windy air. Out to the east, one star — or was it a planet? — gleamed especially bright and steady. I thought of the Wise Men. How long, I wondered, would I have to wait to see a “shooting star”? Would this be a fool’s errand, a waste of perfectly good sleep time? The news site had warned us to dress warmly, as this is December. But the night sky here is so dark I could sit cozily indoors, in the dining room, wrapped only in my bathrobe. I’m not very good at patience, but it was silent and dark and I had nothing else to do at that moment if I wasn’t going to sleep. I sat looking out the window with the largest view — the one that faces Cody and Saskatchewan — and soon a narrow flash of brilliance zoomed past, low on the horizon, just above the windowsill. A good omen. Were those faint swipes in my peripheral vision tiny meteors, or just my imagination? Giving Nature the benefit of the doubt, I counted both of them: Two. Three. Then, closer to my center of vision, numbers 4 and 5. This image does look very similar to the night view from my window, but I didn’t see anything that looked like a fireworks display. A meteor shower isn’t like what you take in the bathroom after a hard hike, I discovered. It’s a drop here, a splash there. As my eyes adjusted to the dark, I began to trust the fainter flashes that would travel about a millimeter’s apparent distance across my field of vision. They vanished much too quickly to be wished upon. But meteor number 10 was a superstar of falling debris: It began above my head and swooped slowly “northward,” toward the horizon, blazing downward for 2 or 3 whole seconds. I almost imagined I could hear a whooshing sound. I was too amazed to make a wish. You can see new entries of Living Dubois every week if you sign up at the top of the right column at www.livingdubois.com. Once in a while, on a summer morning, I awaken to what sounds like cattle in the living room. There aren’t really cattle in the living room. The first time I heard this, however, I did leap out of bed to check. It was just the clamor of cattle complaining loudly as they were being driven down the highway in front of the house, from a pasture uphill to the valley below. When one wandered onto our driveway, a cowboy rode over to steer it back. Cattle trucks drive down the highway past the house all the time. But for a city girl, my first sight of these cowboys at work was pretty thrilling. One afternoon last week, I came home to the sound of whoops, whistles, and loud mooing in the valley. I ran over to take this picture. They were driving these cattle into a corral from which they would be urged into a cattle truck, which would drive them elsewhere by other means. I feel silly about it, having absolutely no personal experience about the life of a cowboy. But I still get excited at this sight. This is an entirely different process than the one that inspired the term “cattle drive,” of course. This is a mere morning’s effort for these cowboys. The original cattle drives, as anyone who has seen “Rawhide” will understand, were brutal and grueling months-long endeavors that somehow led to the idealized nostalgia that the term “cowboy” evokes today. Two horses got away from one of the wranglers, and Manseau went after them. His horse tripped on a loose rope and Andy fell off, landing on his head and shoulders. More recently, cowboys, Boyd told me, cowboys drove the cattle all the way to Hudson, where they’d be loaded onto cattle cars on the train. The cowboys had to return afterwards on horseback, of course. But there were compensations: A string of bars at regular intervals along the highway once offered a place where cowboys could stop en route home. They’re all vacant now, obviously long since gone out of business. These days, the cattle truck drivers pass right on through to the next town. Evidently I’m not the only person here to be excited at the sight of cowboys driving cattle. When I told Sandy about the tiny roundup next door to our house, she recalled the days before the cattle trucks, when the ranchers used to drive the cattle right through town in the fall and on down-county. It was very exciting for the school children, she recalled, but the streets were very messy afterwards. My friend Mary Ellen remembers that St. Thomas Church would halt services so the parishioners could go outside and watch the cattle drive through town. No doubt the cattle were so loud that they would have made the service inaudible anyway. This brought back to her mind a tourist, an older woman driving a little sports car, whose progress was also halted by the cattle drive. Mary Ellen recalls that she was wearing white sneakers. She leaped out of the car, all excited, and began taking photographs. After the cattle had passed, there was no way to keep her sneakers clean when she returned to the car. The cowboys are enchanting, but I often find the cattle an irritation. They might break through a fence and cause trouble. They sometimes get slow my progress on hikes. Another blessing for our health on the heels of the new pharmacy. “What happened to your hand?” friends were asking yesterday. In fact, the bandage is there to protect the minor laser burns sustained during my latest biannual ritual at the skin doctor. She found more of those pre-cancerous spots, and zapped them away. It’s ugly, but not painful, and it will heal quickly. Why am I sharing this? Because of another blessing that has come to town, hot on the heels of our new pharmacy. For this visit, I didn’t have to take the usual 90-minute drive over Togwotee Pass to Jackson to see the dermatologist. This time (on the morning of our first snowfall, as it happens), the dermatologist and the rest of her team came to me. This could have been their last monthly visit at the end of a six-month experiment. But they’ve decided to keep coming every month, year-round. This is no small favor. That a specialist and her team will come over the Pass to spare dozens of us driving the other way in order to detect early skin cancer is a very important benefit in this remote town. At around 7000 feet, the sun is deceptively brutal here. It’s not hot, but it’s dangerous–especially for someone with a family history of skin cancer, but actually for anyone. I never go outdoors without a generous application of sunscreen and a hat with a brim. There would not have been any sunscreen available to my grandfather, who was a Nebraska farmer with fair skin. I’m guessing there were no public-health messages about the risks of the sun during the Great Depression, and as you see him standing here in the barn door, he was not wearing a hat. He died from melanoma that arose on the back of his neck. I envision him laboring for hours on his tractor, head bare, sun at his back as he plowed the furrows. My mother (not a rancher but a teacher) regularly had pre-cancerous lesions taken off her skin. Now so do I, as do many of my neighbors. Thank heaven. And thanks to Storey Donaldson, office manager of Western Wyoming Dermatology & Surgery, who proposed adding Dubois to their satellite offices in Pinedale and Afton. This week was the end of a six-month pilot project to see whether the practice would attract enough patients in Dubois to justify the effort. Not only have they gained new patients from our town, Storey told me; about half of their visits in Dubois are from people farther down the valley, in Lander and Riverton, who would not want to make a 3-hour trip all the way over to Jackson. Back in the day, someone would ride on horseback all day and hope to be able to bring a doctor back in time before the injured person died. Today, we have two clinics and regular access to preventive care. One clinic now offers dermatology visits once a month; the other offers telemedicine links to specialists at the best hospital in the state. There’s also an ambulance service with response times that match national standards, air lifts to regional intensive care centers, and search and rescue crews that venture out to help people injured in our wilderness. In New York City, I left behind some of the best medical care in the world. But I don’t spend much time even thinking about that. So what did I do after seeing the dermatologist on Wednesday, instead of spending 90 minutes driving back from Jackson? I put on my hat, of course, and took the dog for a ramble.